Hey Friends! Thanks for your support of Tabletop Truths. We are excited to tell you about our new website www.tabletoptruths.com Thanks to Little Fish web design in McKinney, Tx for doing such a great job! Please share our new site with your friends as FB is blocking us from sharing it for some reason. :( We are thankful for each of you...blessings to you and your families! And don't forget to order your placemats for Christmas gifts! Put some Placemats Under the Tree...or in the Mail! Need some unique gifts this season?? Tabletop Truths is the perfect solution!! For the kiddos and young families in your life you can't go wrong with our durable, colorful placemats that teach kids Biblical truths! They are SUPER easy to mail and great for those long distance friends and family you neeed to ship something to. Tell us in the memo line that it's a gift and we'll tie your placemats up with a cute ribbon and include a card with your message and ship them directly for you! And from now until Christmas if you order 6 or more placemats we will throw in a free "Gospel" placemat. Remember, the last day to order for guaranteed Christmas delivery is December 18! Calling our local Bryan/College Station friends! 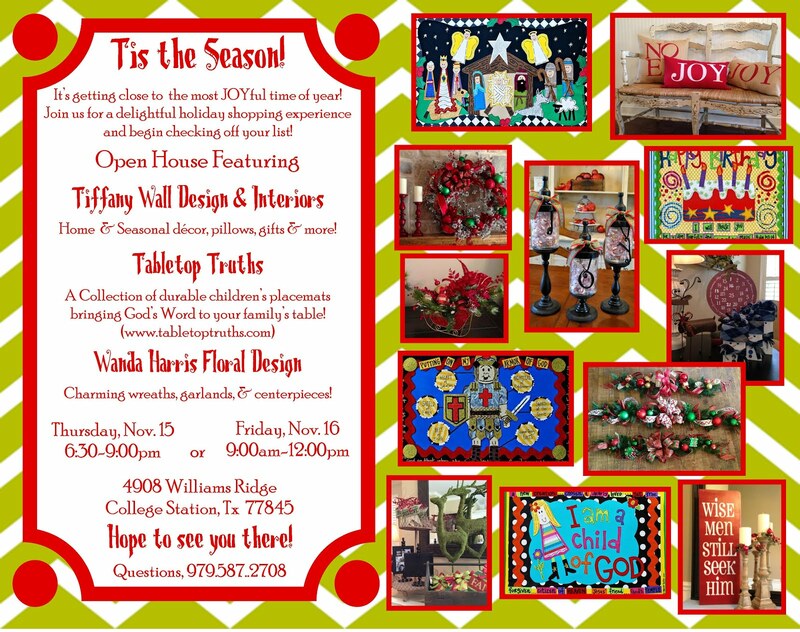 Tis the Season to begin shopping and thinking about decking the halls! 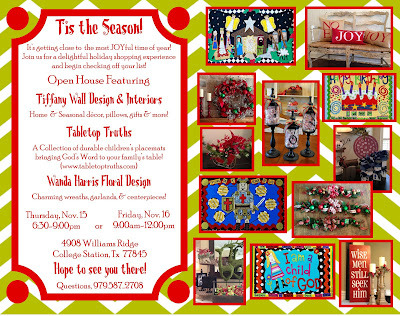 Come and get in the Spirit and join us next week at a Christmas Open House. Enjoy some coffee, treats and perhaps you can begin checking off your list! You will love browsing through a unique assortment of home and seasonal decor, burlap pillows, gorgeous floral design, gifts, and of course children's placemats!! Hope to see you there! All placemat designs © TableTop Truths 2010. Powered by Blogger.